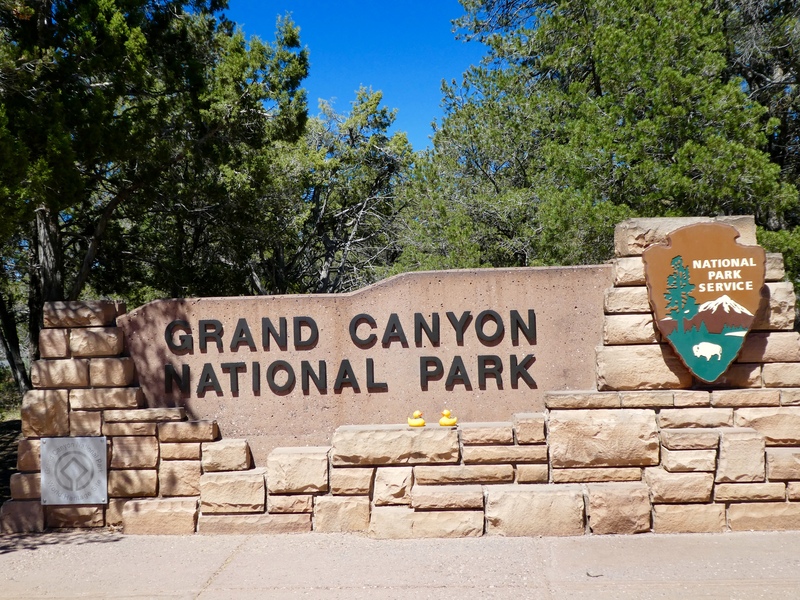 Driving north on Route 64, through beautiful tall pine forests, we reach Grand Canyon National Park. 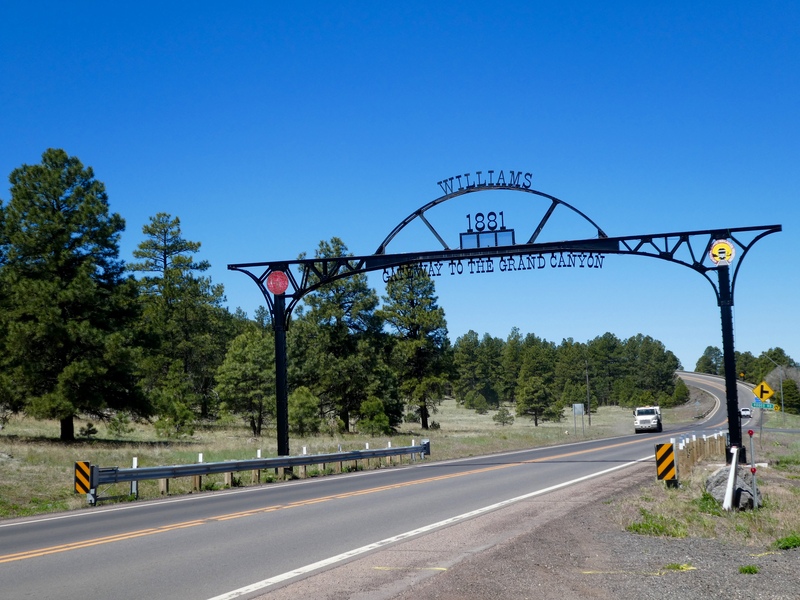 We are entering the park through the South Rim entrance. This is the most developed area of the park, and provides the most amenities for visitors. 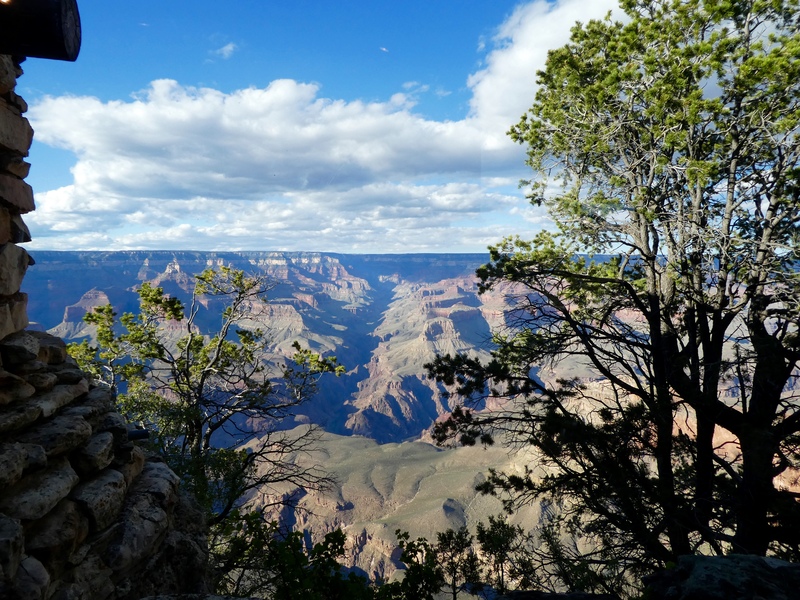 First stop is always the Visitor’s Center, then a short walk to Mather Point. It is rather crowded here, so we begin following the Rim Trail. A very short distance, and we found a new friend. This park is full of elk. 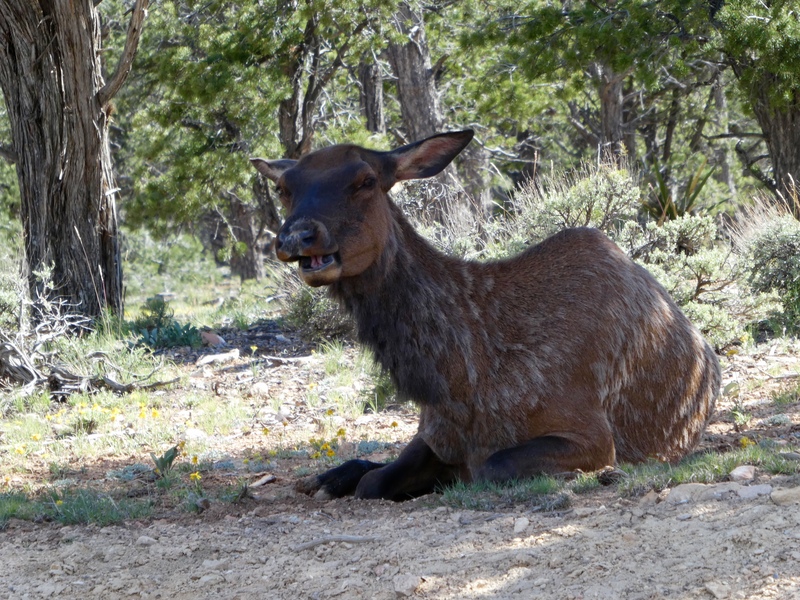 It is spring, and the male elk are just sprouting new antlers. Hard to know if we are seeing male or female elk, but they don’t seem to have any fear of humans, or ducks. Of course, they are protected in the National Park. Continuing along the Rim Trail, we must stop for many photos. Soapy’s mom is holding us. If we fall, we are gone forever. 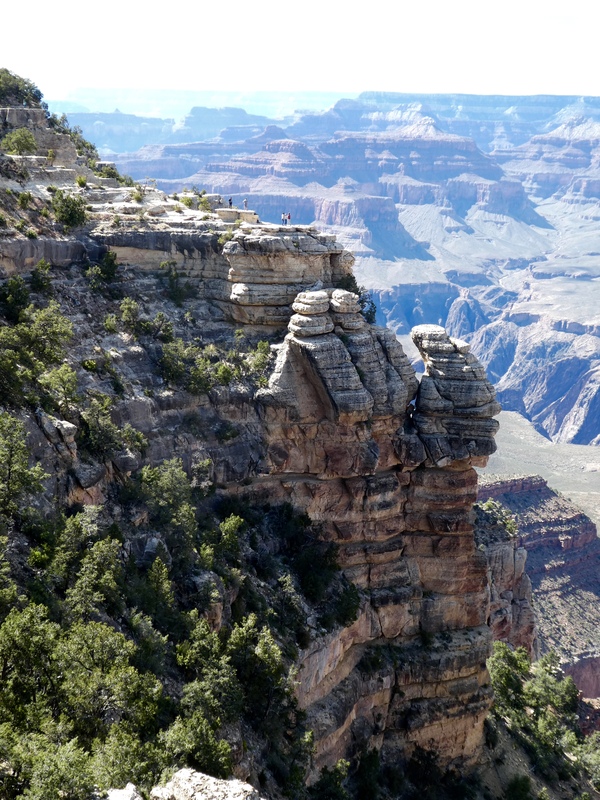 This canyon averages 10 miles wide (up to 18 miles across, or wide, at places) and 277 miles long. And it averages one mile deep, but deeper in places. We reach Yavapal Point and Geology Museum. Geologists decided this was the best location for the museum. This is a great view from the Geology Museum. They appreciated the view, showing several layers of rock. Private cars are not allowed on these roads during main tourist season, so we ride the free and frequent park shuttles. Cars are only allowed to lodges and camp grounds. 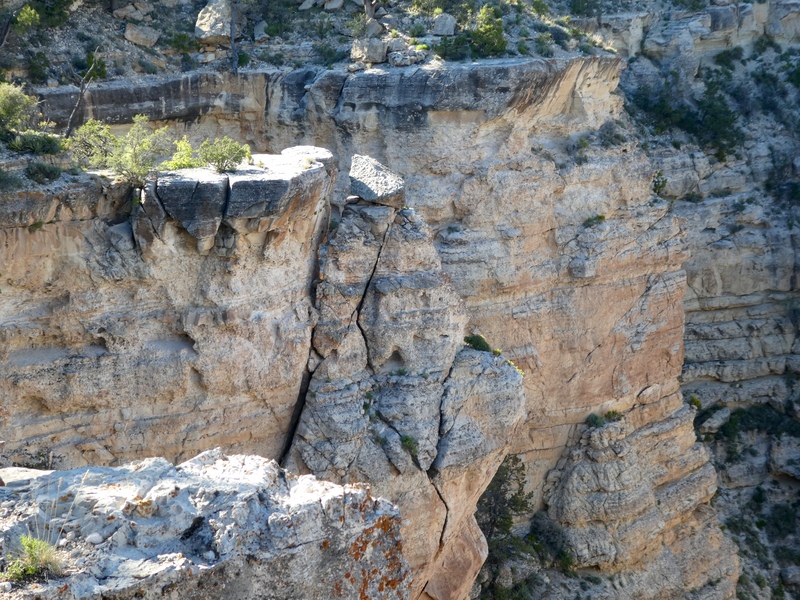 We leave our shuttle at The Abyss and hike more of the Rim Trail. There are very few humans on our trail. Although there are over 5 million visitors each year, the park contains 1,217,403 acres. Avoiding the crowds is really not that difficult. 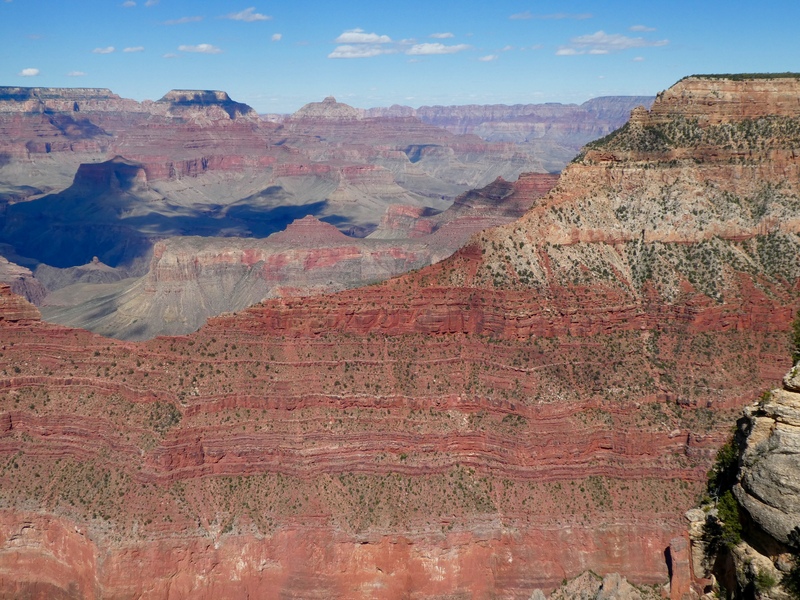 The Grand Canyon was carved by the Colorado River over several million years. As you notice, the erosion process in still happening. When will these huge rocks fall? 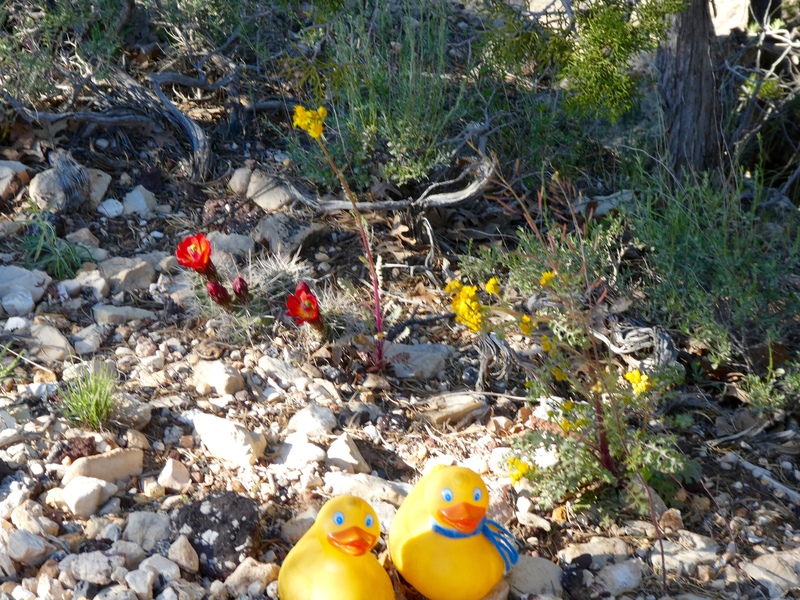 And these pretty wildflowers can grow in this rocky desert climate. Aren’t they beautiful? This is Hermit’s Rest. The shuttle buses end here and Hermit Trailhead will guide climbers to the bottom of the canyon. We hiked a short distance on this steep trail. 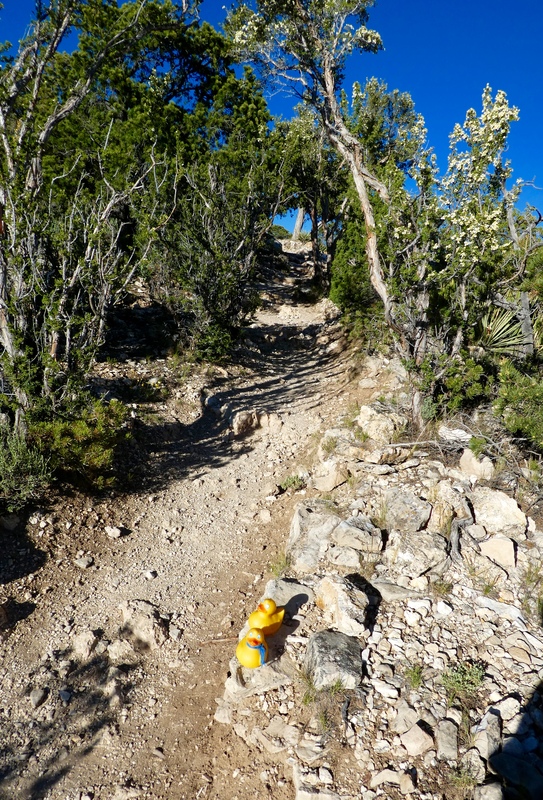 This trail is recommended for experienced desert hikers only. We didn’t go very far. Only about 15 minutes down the trail. 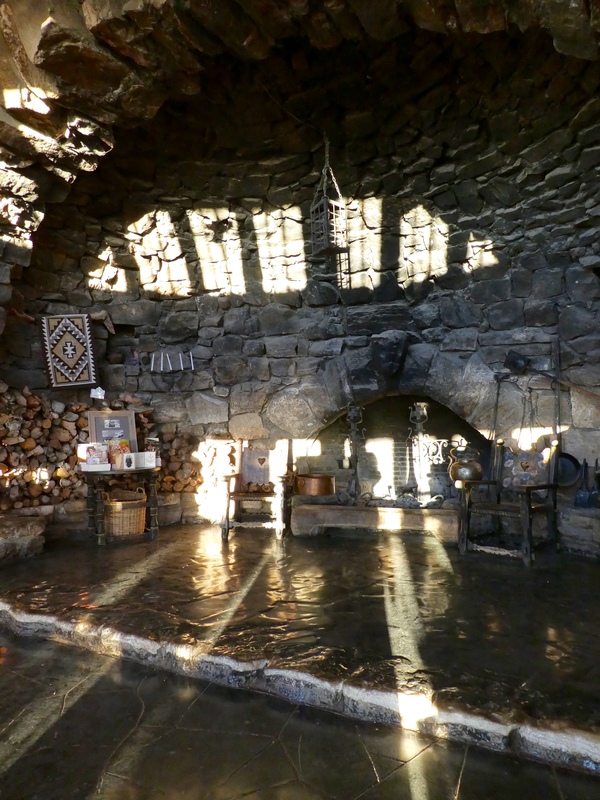 The inside of the lodge is beautiful and huge. This photo should give you an idea. Hermit’s Rest is a National Historic Landmark. The gift shop was nice. We purchased ice cream from an outside window. So good! 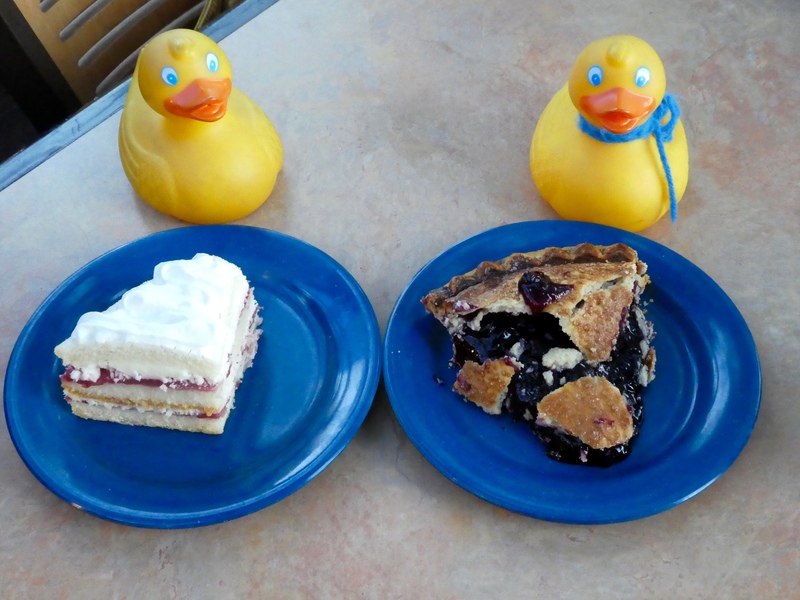 On the way back to Mather Point and our car, we stopped at Yavapal Lodge for dinner and these delicious pies. 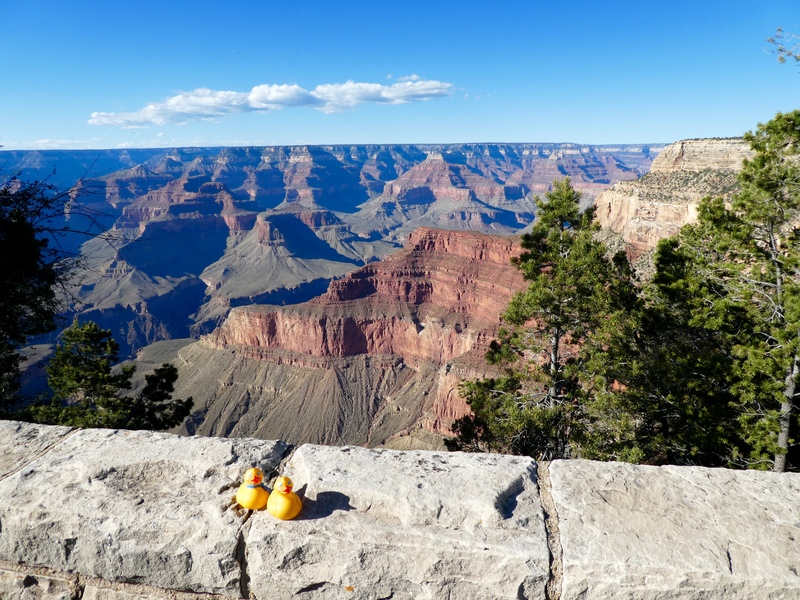 Hiking and admiring the Grand Canyon makes humans and ducks hungry. 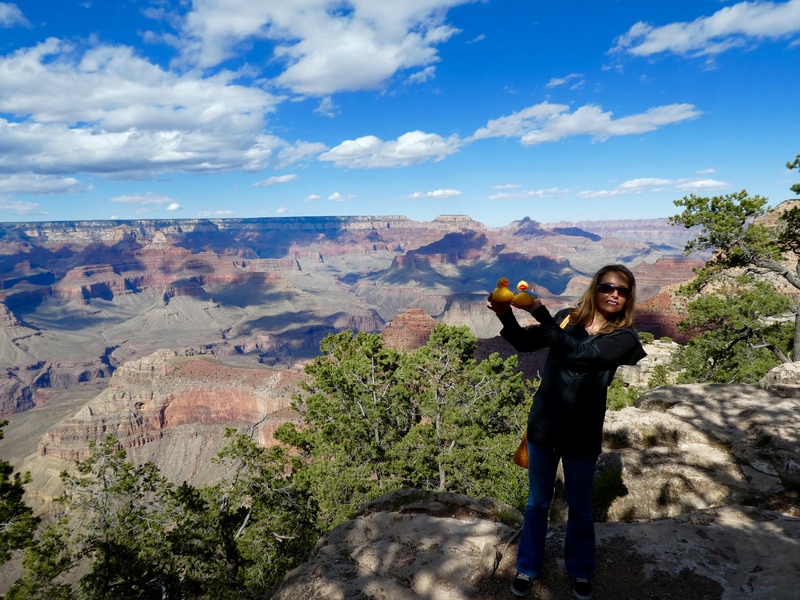 We will show you more of our Grand Canyon experience next time. 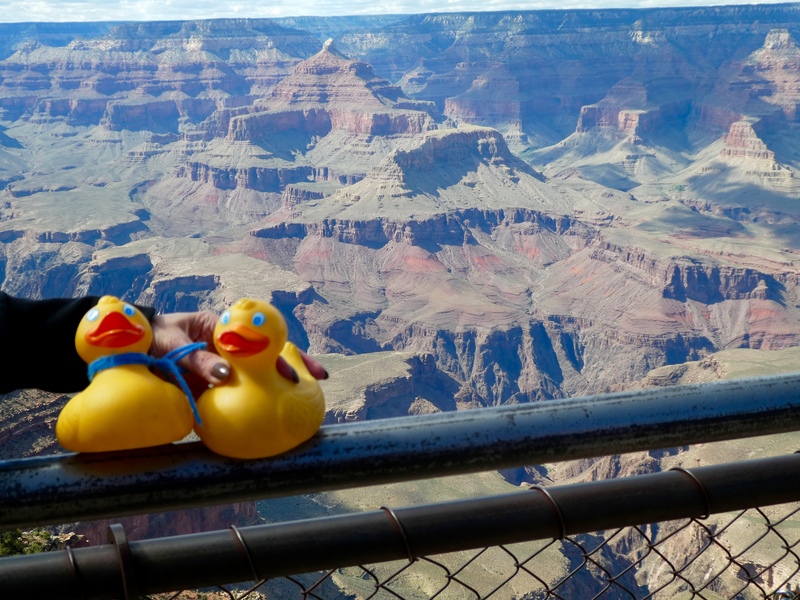 This entry was posted in Arizona, Uncategorized and tagged Arizona, Colorado Traveling Ducks, elk, Grand Canyon National Park, Hermit's Rest, Mather Point, Williams. Bookmark the permalink.